Information to our DressView system This dressing systems is the worlds first which works without sensors and has the advantage that it does not require any sensors in the spindle and therefore cheaper spindles can be used for dressing. DressView ® is offered together with a drive in a desktop case as an integrated solution or as stand-alone solution as a separate system, which lends itself particularly for use in the control cabinet. (Here the frequency converter and a docking station for the DressView ® is then installed.) 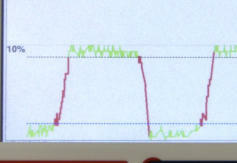 The signal derived from the operation of the spindle is graphically displayed on an LC-display. For signal output to the PLC in each case a limit value for signal detection and, in addition, a higher can be set to a potential crash detection. When the limit is exceeded, the measurement signal is dyed red and a corresponding output connected. The DressView ® system is via laterally arranged foil keys with switching point very easy to operate and adjustable. Various settings can be made for the dressing process, such as the afterglow of last measurement processes as silhouettes, the time base of the representation or the scaling of the display. For communication with the PLC 3 digital inputs, 3 digital outputs and one analog output are available. Via them the system can be started and the current status are displayed. 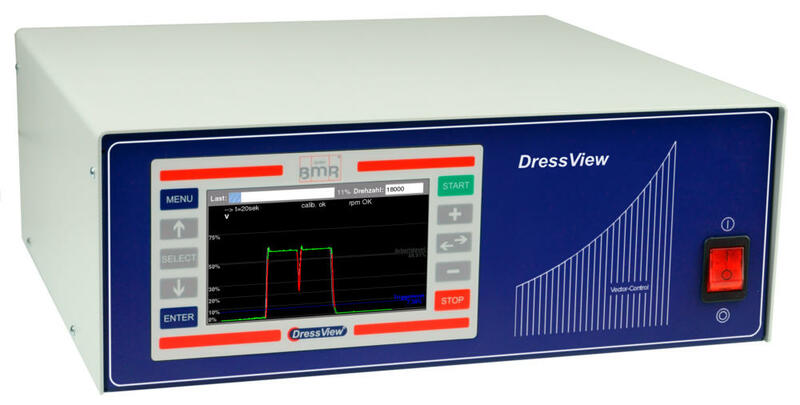 The analog output comes directly from the measurement signal of the dressing. 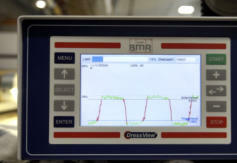 Tests had shown that the sensibility and sensitivity with the established sensor-based process is on an equal footing. In experiments dressing accuracies down to under 0.5 micron were realized. The operating terminal can be mounted either via a VESA mount on your machine, or an arm or as a handy desktop unit on a horizontal surface. Belonging to the operating terminal is the DressView ® SSE cabinet unit. This provides the voltage supply and all inputs and outputs. In addition, it provides a USB interface to the required BMR converters. 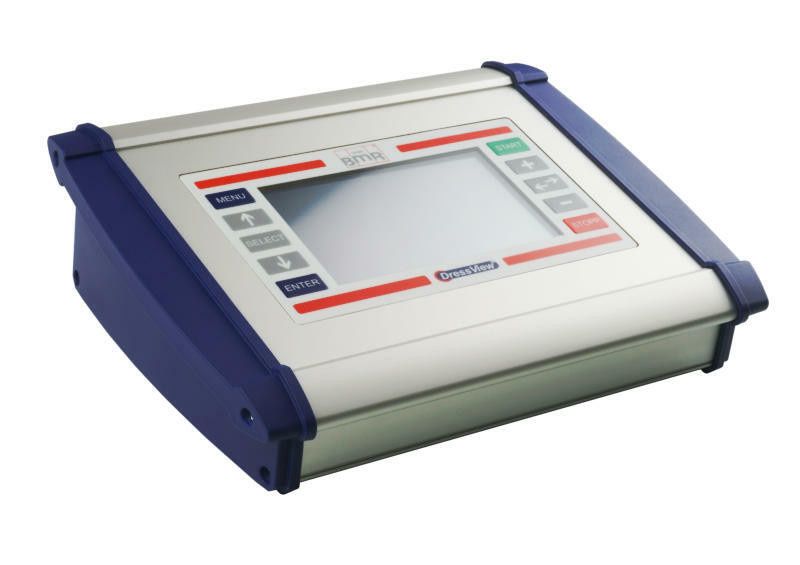 The PMU can be perfectly integrated into a control panel of a production center. Belonging to the PMU is the DressView ® SSE cabinet unit. This provides the voltage supply and all inputs and outputs. In addition, it provides a USB interface to the required BMR converters. Both desktop devices (0303 and 0200) are a compact unit consisting of converters and DressView ® and correspond the performance our SFU0303 and SFU0200. For this reason, both devices have the usual inputs and outputs and screw connections. In addition, there are still the inputs and outputs of DressView ® system. This dressing systems is the worlds first which works without sensors and has the advantage that it does not require any sensors in the spindle and works with an accuracies down to under 0.5 micron. This dressing systems this worlds first which works without sensors and has the advantage that it does not require any sensors in the spindle and therefore cheaper spindles can be used for dressing. DressView ® is offered together with a drive in a desktop case as an integrated solution or as stand-alone solution as a separate system, which lends itself particularly for use in the control cabinet. (Here the frequency converter and a docking station for the DressView ® is then installed.) The signal derived from the operation of the spindle is graphically displayed on an LC-display. For signal output to the PLC in each case a limit value for signal detection and, in addition, a higher can be set to a potential crash detection. 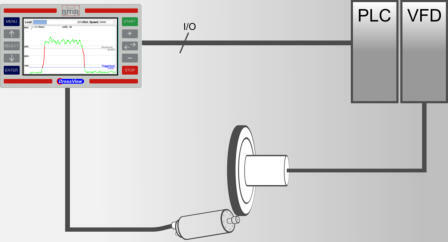 When the limit is exceeded, the measurement signal is dyed red and a corresponding output connected. The DressView ® system is via laterally arranged foil keys with switching point very easy to operate and adjustable. Various settings can be made for the dressing process, such as the afterglow of last measurement processes as silhouettes, the time base of the representation or the scaling of the display. For communication with the PLC 3 digital inputs, 3 digital outputs and one analog output are available. Via them the system can be started and the current status are displayed. The analog output is directly from the measurement signal of the dressing. Tests shown that the sensibility and sensitivity with the established sensor- based process is on an equal footing. In experiments a dressing accuracies of under 0.5 micron were realized. Field Test: This was a test which was performed in an industrial process. The raising strokes represent a forward feeding of 1 micron. As you can see the repeatability in this test, despite the fast working speed is very high, thanks to our high resolution. In this test a 42mm spindle with a diamondwheel was used to dress a CBN-wheel. The dressing thereby held under high pressure coolant, which was been calibrated out but through our system. Also you can see the functionality of our two individual ajustable levels. The lower one is the triggerlevel, which detects the contact with your tool an the upper one is the workinglevel, which helps you to qualify your resulting surface.